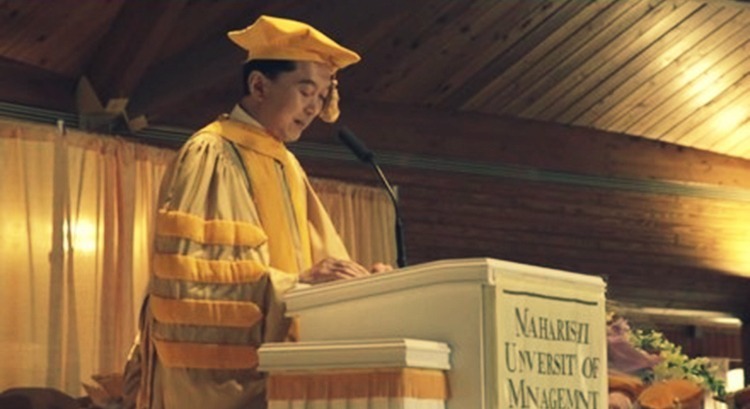 Yukio Hatoyama, Japanese prime minister in 2009-2010, expressed his ’deep gratitude for this wonderful gift of Transcendental Meditation’ when addressing a record number of graduating students at Maharishi University of Management. After congratulating the graduates, Dr Hatoyama devoted his commencement speech to the benefits of TM, many of which he has experienced first-hand. A DIVERSE YET HARMONIOUS COMMUNITY: The class of 2015 graduating students at MUM included 96 undergraduates and 252 graduate students from over 60 different countries. Also receiving degrees were 43 students at Maharishi Invincibility Institute in South Africa, enrolled via distance education. Dr Hatoyama, his wife and his son learned the technique from a MUM alumnus already back in 1989. He also practiced TM during the time he led Japan’s government. “Both myself and my wife, Miyuki, are extremely fond of Transcendental Meditation. Due in great part to the wisdom of TM, we have managed to maintain an exceptionally happy home and family life over the years,” Dr Hatoyama told the audience at MUM. “In those days [after having learned TM], our family consisted also of our son, an elementary school student at that time. “I had just been elected a member of Japan’s National Diet. My electoral district was near Sapporo, on the country’s main northern island of Hokkaido, a considerable distance from Tokyo. Our son remained in Tokyo; whereas I spent most of my time in my electoral district. “My wife Miyuki made trips between those two locations. “As a result, the three of us were unable to spend much time together, creating what I would describe as somewhat insecure circumstances. “Looking back now, I truly believe that the ability of our family to maintain happy and harmonious lifestyle, despite the stress of living apart, was due to the teaching of Transcendental Meditation,” told Dr Hatoyama. “It was our son, meanwhile, who particularly came to reflect the values of TM,“ Dr Hatoyama recalled. “When I asked him what he had meant, he explained that he was staying up late to prepare practice questions for his classmates! “As for me, I’m always very happy because I keep this photograph of Maharishi Mahesh Yogi with me. I feel like I’m always with him. 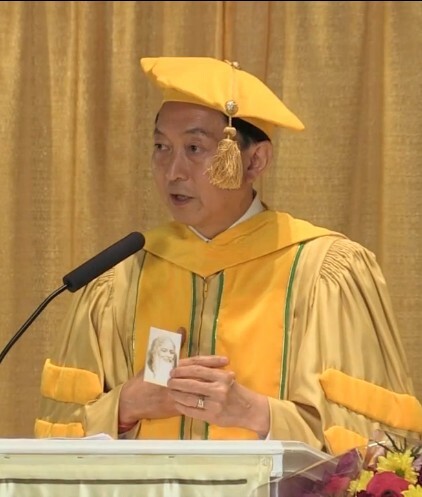 MUTUAL RESPECT AND RECOGNITION: Yukio Hatoyama, always carrying a photograph of Maharishi with him, was awarded an honorary degree of Doctor of Laws at Maharishi University. “Having benefitted so much from this magnificent bond, Transcendental Meditation, it is a particular honor for us to be able to come to Maharishi University of Management. I can only say that this visit has further strengthened my sense of awareness and familiarity with the wonder of TM. “I feel even more determined to draw from the peace and happiness that my own family has experienced thanks to this discipline – to contribute to the peace and happiness of the whole world. 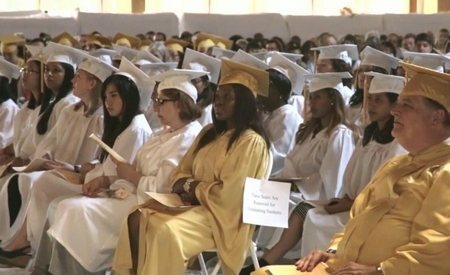 “In fact, I pledge to do everything in my power to move in that direction,” Dr Hatoyama promised in front of the 391 graduating students. “It’s my firm belief that bonds of fraternity created between individuals will naturally evolve into bonds of fraternity between countries, between regions, and then – to peace around the world. “I’m deeply impressed by the success of Maharishi in defining a concrete and simple route to that end. “His conviction was that world peace can never be achieved through the use of military force. “Rather, he urged that the only true way to peace lies in the practice of Transcendental Meditation and other constructive, non-violent means. 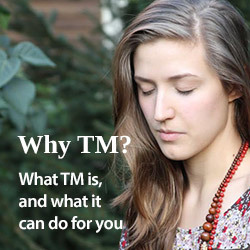 “By practicing TM as individuals, we can rise above physiological and psychological stress. By doing that, it is possible to lower the level of stress in the collective consciousness. Who is Dr Yukio Hatoyama? Dr Hatoyama is a member of a distinguished Japanese family that has a long history of government service. His great-grandfather was the speaker of the House of Representatives in Japan’s legislature in the late 19th century; his grandfather was prime minister of Japan in the 1950s and helped secure membership in the United Nations for Japan. His father was Japan’s foreign minister. His younger brother served as Minister of Internal Affairs and Communications. Dr Yukio Hatoyama’s own political career began in 1986, when he was elected to the House of Representatives. He was instrumental in forming two political parties in Japan and was credited by Timemagazine with helping Japan take steps toward a multi-party system after decades of single-party government under the Liberal Democratic Party. He was elected prime minister in 2009, and achieved many important breakthroughs during his nine months in office. His key decisions included greater spending on education and student scholarships, and free support services for people with disabilities. Under Hatoyama’s leadership, Japanese relations with China became more cordial. 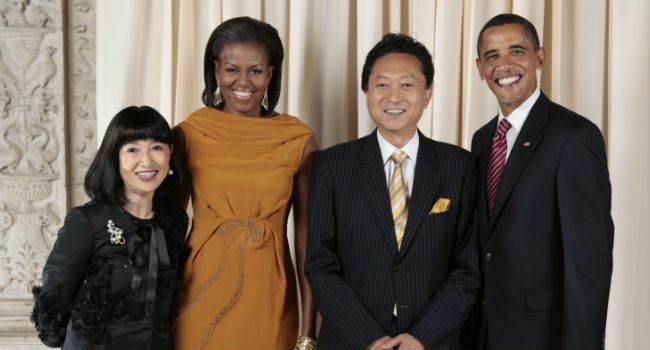 A WORLD LEADER: Yukio Hatoyama and his wife Miyaki during a visit to the White House in 2009.